A beginner's guide to Instagram for business. | KateCoote. 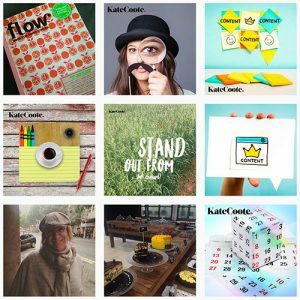 A beginner’s guide to Instagram for business. Are you looking for a beginner’s guide to Instagram? It seems that many of my clients in Nelson, New Zealand and throughout the UK (Chichester, London and Kent), have begun to embrace Instagram for business. However, a few have contacted me saying they are still unclear how to set up an account, and what to do with it when they have. So I thought I would put together a quick beginner’s guide to Instagram. Create an account: Download the Instagram app for Android or iOS and follow the sign up instructions, (you can sign up with Facebook or email). You can also sign up for your account from your Desktop, but I wouldn’t recommend this because Instagram is essentially built for mobile. So it pays to embrace mobile from the get-go! If you choose not to log in with Facebook, you’ll be asked to create your username and set your password at this stage. Instagram accounts are public by default, but you can choose to make yours private. Head to your profile tab and scroll down to Privacy. Importantly, I wouldn’t do this if you’re using your account for business, you need to let people connect with you to reap the rewards. Complete your killer bio: Upload your profile image, my top tip here is to consider using your beautiful/handsome face, rather than your logo; because people want to connect with people! Add a description, make this keyword rich. It’s also okay to use emojis and emoticons (these can often be descriptive)… 😊! Include your website, but there’s a separate field for this so it appears as a link, (don’t waste your (150) bio characters). Connect to other channels: To connect social accounts, head to the Profile Tab > Settings > Linked Accounts then choose the networks you wish to connect. Your Instagram account will link to your personal Facebook Timeline by default. To link to a Page instead, tap Facebook and choose a Page that you manage. Share something: Press the camera icon. This will allow you to select a photo from your library, take a photo, or record a video (from 3 to 60 seconds in length). If you select or take a photo you then get the chance to apply a filter, these show as icons along the bottom of your phone screen. You can also edit the image, the best policy here is just to experiment with the editing options. Once you’re happy with your image click next (top right). Now you can write a caption, tag other users, include your location and choose to share across other networks (see above), these are all optional. Follow the instructions to share your image. More on captions: Instagram captions don’t have a character limit, but try to keep yours concise and let your image tell the story. Top Tip – Ask a question in your caption. Clickable URLs aren’t allowed in your captions, just the website box in your bio, so you can either update that each time you post (to include a targeted call to action) in which case you might type link in bio into your caption; or include a more generic, easy to remember URL. My captions usually include katecoote.com/blog viewers can’t click, but it’s not too long for them to type into a browser if they want to find out more. Don’t forget the #hashtag: Try to limit these to 4-6 and make sure one of them is unique to you. If you’re too generic you’re not going to get as much genuine audience engagement. For example if you’re a locally based (for example, Nelson, NZ) coffee shop, using the Hashtag #coffee, you could find yourself competing with many others many other cafes around the world using that same Hashtag; but if you used the Hashtag #bestcoffeensn you’d be narrowing your niche to an audience that might actually be stepping through your door some time soon.